This character is not what she appears. 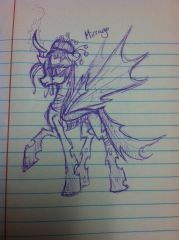 Lol in the sense she is a changeling. Often Mirrage is seen as silent and given an emotionless stare coupled with very expressive movements; such as the shoulders, eyes and ears. Wings as well. She is very dutiful to whomever she serves. Originally she was the competent lacky; the yes-man of a villain I'd once conceptualized. The humor of her was that she nevers talk though she CAN in fact talk. The villain would ask something deep or in need of advice... and just when she opens her mouth he'd cut her off like "Wait! No you're right, that's BRILLIANT!!" and she would just idly go back to reading her book. However; Mirrage does talk fluently when disguised as other ponies. She is an exceptionally powerful changeling with several custom forms she uses to do battle with others; including the Great Dogling... a huge, Diamond Dog-like beast capable of punching down doors and causing a good lot of destruction. Unless commanded to do so, she is not outwardly hostile. In fact she'd prefer to laze on a pillow and read or draw. (Inspired by the events of today's episode...) So someone accidentally activated Starswirl the Bearded's unfinished spell before Twilight Sparkle had a chance to complete it. What opposite destiny and "wrong" cutie mark did you get stuck with before she fixed it?